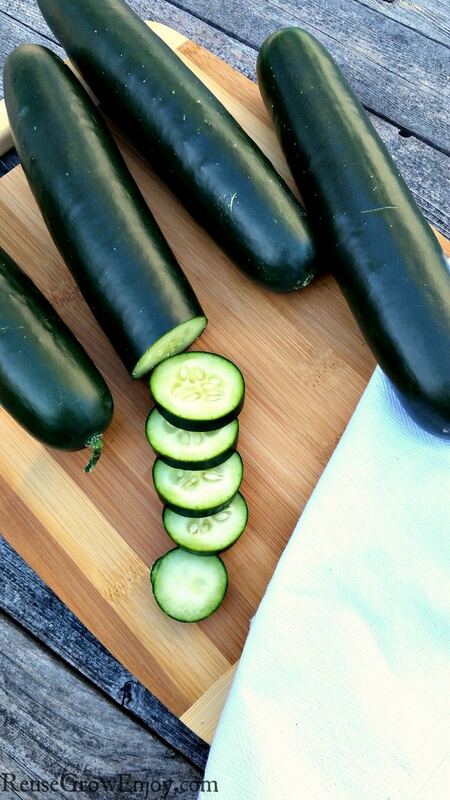 When one thinks of gardens and growing food in the summer, many minds instantly think “grow cucumbers”. What a versatile food a cucumber truly is. But what if you don’t know how to grow cucumbers? If that is the case, I am going to share a few great cucumber growing tips with you. The cucumber is delicious raw, amazing pickled..and you can actually peel them, stuff them, eat them and even drink them. Not many food items can wear that many hats. It’s impressive! Not only are they easy and fun to eat, they are really healthy for you and your body as well. They are packed with a variety of nutrients and help to keep you hydrated. Their composition is made up of 90% water, so eating them can also help you feel fuller compared to other foods with less water content. Sounds like an awesome food to start incorporating more into your life, right? 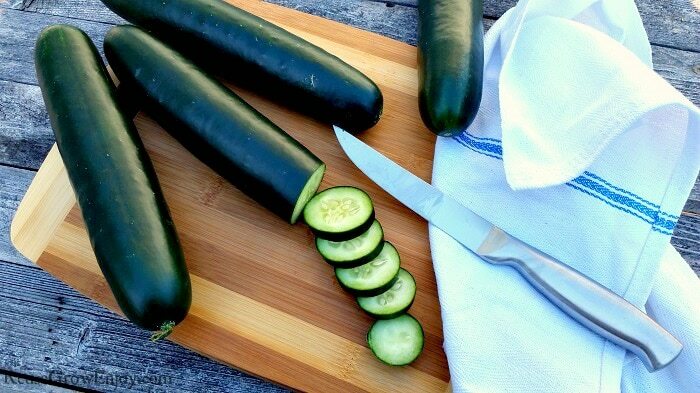 If you are a gardener or have interest in starting your own garden, cucumbers are a great food to begin with. They tend to be one of the easier plants to grow in a garden and their growth pattern is quite quicker than a lot of others. If you are worried about being able to plant something in your garden that will sustain and grow, then a cucumber may actually be a good plant for you to start with. While they do need some maintenance and care, once they start to produce, they tend to have a mind of their own and can really take off! Keep in mind that cucumbers plants grow on the ground or vertical because they are a vine plant. They are great to grow on a balcony or in another small spaced area where there isn’t room for a garden. Simply plant in a container and train them to grow up with stings or trellis. Don’t plant them too early! They aren’t a cold-weather vegetable and the frost is not their friend. The frost can zap them quickly in the garden causing your crop to be done before it even gets started. Your soil temperature needs to be warmer. Cucumbers need a neutral soil balance and full sun, if possible, for best-growing conditions. In addition, they need to stay hydrated! Remember, they are made up of 90% water. Make certain that they stay watered on a consistent basis. At the start of the plant, they don’t need as much water as they require when they start producing cucumbers. Use good fertile soil for them to be able to grow. If you have soil that is not so great, there are things you can do to improve it such as using Natural Fertilizer. When beginning to plant the seeds, try to space them out with about 18 – 24 inches or so between each seed you plant. Bury each seed about 1 inch or so deep into the soil. If you are in a colder area, you can start the seeds indoors and then transfer the plants outdoors when it warms up. If you want to get the plant to grow vertical, you need to train it. This is such a garden space saver. When you grow cucumbers they can take up a lot of ground space in the garden. But when you train them to grow vertical, it saves so much space. You can even have it grow at an angle like an archway so that you can grow other plants that like to be shaded under them. You can do this by putting a trellis close to the plant. Then as it starts to grow and has the vines that reach out to grab hold of things, help them to wrap around the trellis. After it starts to attach and grows up about 10 inches, it should start grabbing it on its own and no longer need you to help it. Things you can use as a trellis is lattice panels, wire fence, netting, a string that is weaved. The options are really endless. Now that the plants are growing they will start to grow cucumbers. Make certain to try to keep weeds clear of their area, like you would do for any other food growing in your garden. Keep the soil moist but not under water. If the soil ever looks dry, or if you put your finger in the soil and it’s dry under the surface of the top layer, the plants need water. Try to water around the base of the plants and not on the leaves directly to prevent any type of leaf issues. A prime time to water plants is early in the morning or later in the afternoon after the sun begins to set. If you do it in the heat of the day, it will evaporate before the plant has a chance to soak it up. These are just a few suggestions for ways to grow cucumbers. Before you know it you will be eating bushels and bushels of cucumbers for months to follow! If you have them in abundance growing from your garden, start planning on ways to pickle them and can them so you can enjoy them all winter long as well! If you are looking for other gardening tips, here are a few to check out.